Navigate: Homage / News / Communicate through the early 2016 special editions of "Le JUSTE LIEN"! Communicate through the early 2016 special editions of "Le JUSTE LIEN"! The first issue to appear will be Le JUSTE LIEN Special UK, published in English and distributed at the SPATEX exhibition from 31st January. After the success of its No. 1 edition, EuroSpaPoolNews is preparing its Special Edition No. 2, dedicated to the Benelux market: Le JUSTE LIEN Special BENELUX. 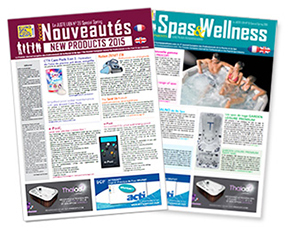 This journal is published in French and Dutch, and distributed to Pool and Spa professionals in Belgium, the Netherlands, Luxembourg and departments in the north of France. Joeri DILS, Chairman of the BSPA, the association regrouping swimming pool specialists, pool equipment manufacturers, and suppliers in Belgium, and Director of T&A, had this to say about the launch of this edition: "Publishing a Benelux edition is a good initiative. We have seen that in Belgium and in our neighbouring countries, the desire to live a well-being experience is growing stronger. People have to work harder and longer, which means finding a right balance between work and relaxation". Professionals, if you too wish to make yourself known in this growing market, we urge you to communicate in this edition, through advertisements and information on your products and your company. For more information, contact us. Le JUSTE LIEN Special SWITZERLAND / AUSTRIA No.1 is being prepared! This brand new edition, dedicated specifically to the markets of Switzerland, Austria, Liechtenstein and neighbouring regions in Germany, France and Italy, will be sent to professionals in these countries. You will also get media coverage when you advertise your new products and news updates targeting these markets on our site, eurospapoolnews.com, in all three languages as well as in our newsletters. For more information, or to send us your editorials and advertising elements, please contact us. As every year, in 2016, our Le JUSTE LIEN Special ITALY edition will be distributed free of cost at the FORUMPISCINE exhibition being held from 18th to 20th February 2016. We will be present at this 17th edition in Bologna and at the 8th International Spa & Pool Convention. The journal will be published in Italian and information on new products and updates will be widely circulated through our website eurospapoolnews.com and our newsletters. Also look forward this year to our Le JUSTE LIEN Special MOROCCO, which will be published in French and distributed free of cost at the PISCINE EXPO MAROC exhibition, being held in Casablanca from 2nd to 5th March 2016. Professionals, book your ad and present your latest products and news in this edition dedicated especially to the Moroccan market. And of course you will not want to miss the Spring issue of Le JUSTE LIEN New Products and its supplement Spas & Wellness. In English and French, it will be sent to 10,000 professionals in France and abroad. All the information is repeated on our website and in our newsletters and will enable you to reach a large audience of Pool and Spa professionals.